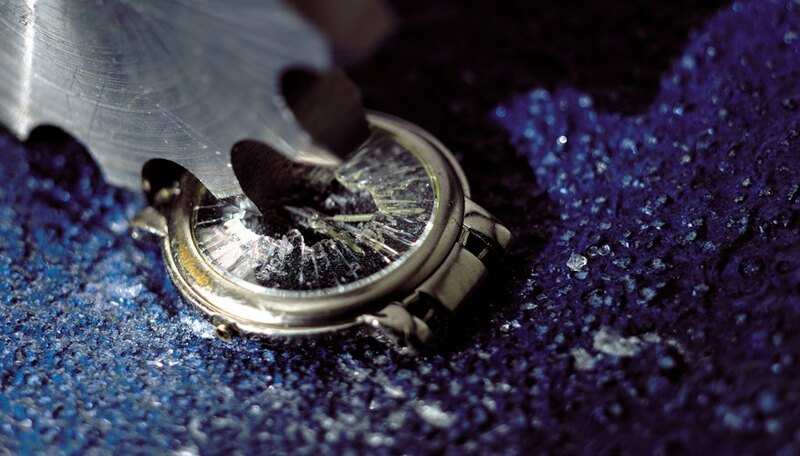 Repairing a cracked Bulova watch dial or the crystal that covers the dial is not practical. Only replacing the dial, sometimes called a face, or the crystal, which is the glass cover of the dial, is possible to rescue a damaged Bulova. Cracked acrylic crystals are common. However, inexpensive replacements are easy to find and to install. It’s difficult to crack a watch dial unless with extreme force. Owners of contemporary Bulovas should not attempt to replace the dial or crystal, but have a professional watchmaker perform the task. Remove the case back of an older Bulova watch by inserting a case blade between the case back and case if the watch features a snapdown case back. Pop the case back open. If the case back is a screw down version, use the palm of hand and rotate the case back counterclockwise until it’s free. Remove the two screws that fasten the movement, which is the small spring engine that operates the watch, to the case. Detach the movement from the case. Place the movement with the dial face up on the table. Place the hands-grabber remover on top of the dial directly over the center post. Use the grabber to remove the hour, minute and second hands. Flip the watch with the dial face down. Remove the two screws that fasten the dial to the movement. Separate the dial from the movement. Place the replacement dial on top of the movement. Repeat Steps 1 through 4 in reverse order to re-assemble the watch. Use a rubber jar opener to grasp the bezel of the Bulova watch. The bezel is the ring that fastens the crystal to the case. Use your fingertips to hold the rubber jar opener to rotate the bezel counterclockwise until it’s detached from the case. Remove the acrylic crystal from the case. The crystal may be further fastened to the case with a small amount of adhesive. Use the case blade to pop off the crystal. Replace the cracked crystal with a new one. Place the crystal on the case. There is no need to use an adhesive. Use your thumb and forefinger to screw clockwise the bezel into the case. Tighten the bezel using the rubber jar opener. Replacement dials, or faces, and crystals are available through numerous brick and mortar and online watch parts vendors. Some restoration watchmakers may rescue an original dial if it only has a hairline crack. Restoration experts may be able to repaint the dial, although the job can run into the hundreds of dollars. Disassembly of virtually all pre-1980 Bulovas by a novice is possible, but contemporary models featuring pressurized seals may require disassembly by a professional watchmaker. Don’t attempt the task without professional help.